Energy Suspension's transmission mount inserts are made from their Hyper-Flex polyurethane which will decrease the bushing compliance common with rubber bushings. These polyurethane bushings are unaffected by oil, smog, road salt and most chemicals so they won't soften compress or distort like rubber does. 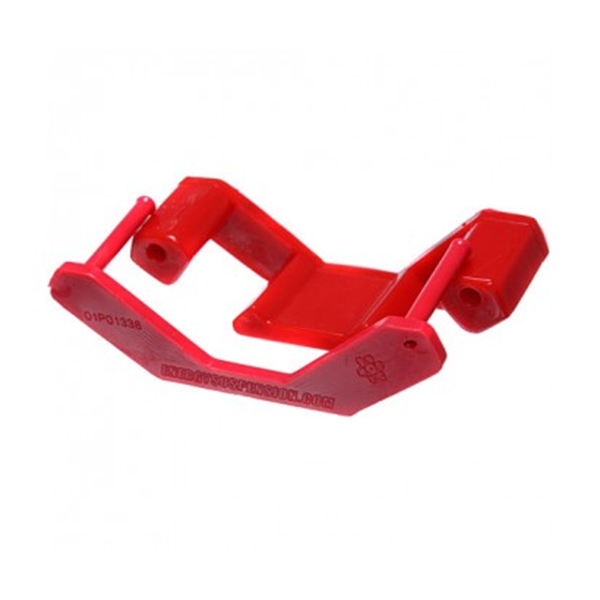 This heavy-duty Energy Suspension red polyurethane transmission mount insert is soft enough for daily use on the street, and strong enough to hold up to the abuses of high horsepower and racing. Difficult shifting due to overly compliant factory bushings has been a problem on both the S197 and S550 chassis. By eliminating transmission movement they help keep the shifter in proper alignment, reducing the chance of shifter bind and missed shifts. 2011 2012 2013 2014 2015 2016 2017 GT 5.0L Boss 302 Ecoboost 2.3 V6 Mustang Roush & Saleen Vehicles with MT-82 Manual Transmission. No one else can stack up to the bold clean styling of our aftermarket Billet dress ups, Street Strip & Racing Suspension & Performance Parts for your late model American Muscle Car!